The enzyme systems carrying out this biotransformation are referred to as mixed-function oxidases or monooxygen-ases.24,25 There is a large family that carry out the same basic chemical reactions. Their nomenclature is based on amino acid homology and is summarized in Table 3.2. There are four components to the name. 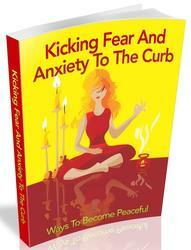 CYP refers to the cytochrome system. This is followed by the Arabic number that specifies the cytochrome family (CYP1, CYP2, CYP3, etc.). Next is a capital letter that represents the subfamily (CYP1A, CYP1B, CYP2A, CYP2B, CYP3A, CYP3B, etc.). Finally, the cytochrome name ends with another Arabic number that specifies the specific enzyme responsible for a particular reaction (CYP1A2, CYP2C9, CYP2C19, CYP3A4, etc.). 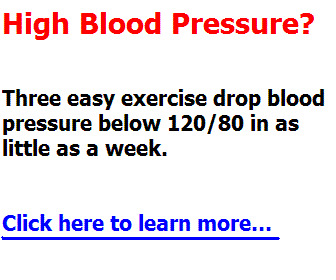 The reaction requires both molecular oxygen and the reducing agent NADPH (reduced form of nicotinamide adeno-sine dinucleotide phosphate). During this oxidative process, one atom of molecular oxygen (O2) is introduced into the substrate R-H to form R-OH and the other oxygen atom is incorporated into water. The mixed-function oxidase system26 is actually made up of several components, the most important being the superfamily of CYP enzymes (currently at 57 genes [http://drnelson.utmem.edu/CytochromeP450.html]), which are responsible for transferring an oxygen atom to the substrate R-H. Other important components of this system include the NADPH-dependent CYP reductase and the NADH-linked cytochrome b5. The latter two components, along with the cofactors NADPH and NADH, supply the reducing equivalents (electrons) needed in the overall metabolic oxidation of foreign compounds. The proposed mechanistic scheme by which the CYP monooxygenase system catalyzes the conversion of molecular oxygen to an "activated oxygen" species is elaborated below. One important feature of the hepatic CYP mixed-function oxidase system is its ability to metabolize an almost unlimited number of diverse substrates by various oxidative transformations.29 This versatility is believed to be a result of the substrate nonspecificity of CYP as well as the presence of multiple forms of the enzyme.30 Some of these P450 enzymes are selectively inducible by various chemicals (e.g., phenobarbital, benzo[a]pyrene, 3-methyl-cholanthrene).31 One of these inducible forms of the enzyme (cytochrome P448)32 is of particular interest and is discussed later in this section. The CYP monooxygenases are located in the endoplas-mic reticulum, a highly organized and complex network of intracellular membranes that is particularly abundant in tissues such as the liver.33 When these tissues are disrupted by homogenization, the endoplasmic reticulum loses its structure and is converted into small vesicular bodies known as microsomes. Mitochondria house many of the cytochrome enzymes that are responsible for the biosynthesis of steroidal hormones and metabolism of certain vitamins. The catalytic role that the CYP monooxygenase system plays in the oxidation of xenobiotics is summarized in the cycle shown in Figure 3.1.35-37 The initial step of this catalytic reaction cycle starts with the binding of the substrate to the oxidized (Fe3+) resting state of CYP to form a P450-substrate complex. The next step involves the transfer of one electron from NADPH-dependent CYP reductase to the P450-substrate complex. This one-electron transfer reduces Fe3+ to Fe2+. It is this reduced (Fe2+) P450-substrate complex that is capable of binding dioxygen (O2). The dioxygen-P450-substrate complex that is formed then undergoes another one-electron reduction (by CYP reductase-NADPH and/or cytochrome b5 reductase-NADH) to yield what is believed to be a peroxide dianion-P450 (Fe3+)-substrate complex. Water (containing one of the oxygen atoms from the original dioxygen molecule) is released from the latter intermediate to form an activated oxygen-P450-substrate complex (Fig. 3.2). 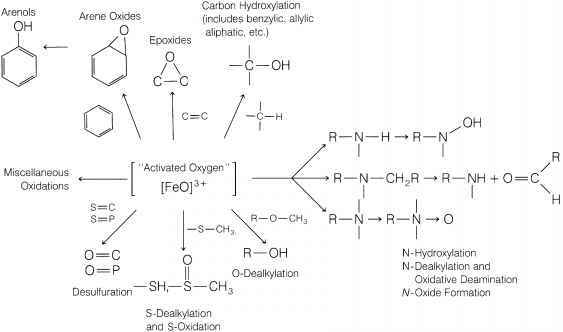 The activated oxygen [FeO]3+ in this complex is highly electron deficient and a potent oxidizing agent. The activated oxygen is transferred to the substrate (R-H), and the oxidized substrate product (R-OH) is released from the enzyme complex to regenerate the oxidized form of CYP. 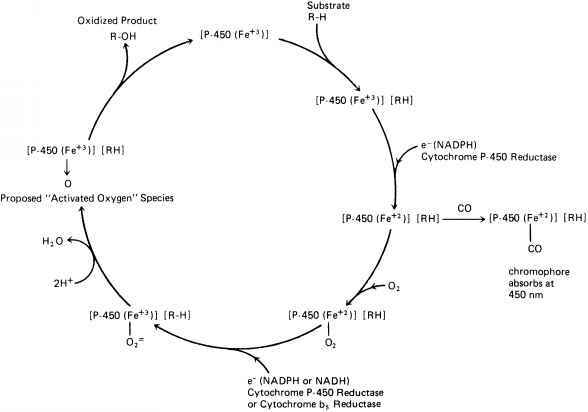 Figure 3.1 • Proposed catalytic reaction cycle involving cytochrome P450 in the oxidation of xenobiotics. Figure 3.2 • Simplified depiction of the proposed activated oxygen-cytochrome P450-substrate complex. Note the simplified apoprotein portion and the heme (protoporphyrin IX) portion or cytochrome P450 and the proximity of the substrate R-H undergoing oxidation. reactions is discussed below.44'45 Our attention now focuses on the aromatic hydroxylation of several drugs and xenobiotics. ethinylestradiol,54,55 and (S)( — )-warfarin,56 among others, undergo extensive aromatic oxidation (Fig. 3.4 shows structure and site of hydroxylation). 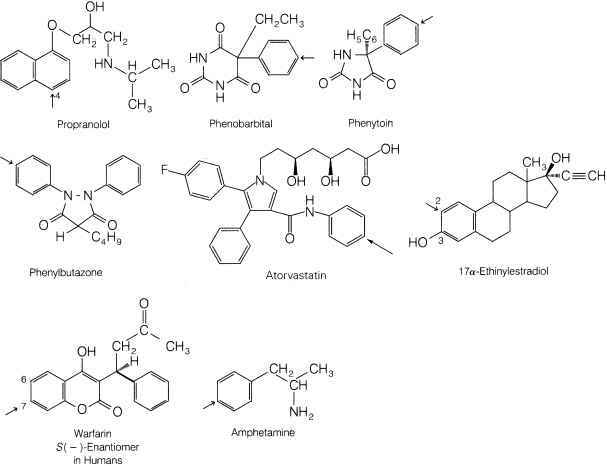 In most of the drugs just mentioned, hydroxylation occurs at the para posi tion.57 Most phenolic metabolites formed from aromatic oxidation undergo further conversion to polar and water-soluble glucuronide or sulfate conjugates, which are readily excreted in the urine. 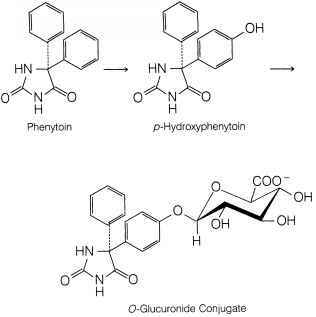 For example, the major urinary metabolite of phenytoin found in humans is the O-glucuronide conjugate of p-hydroxyphenytoin.49 50 Interestingly, the para-hydroxylated metabolite of phenylbutazone, oxyphenbutazone, is pharmacologically active and has been marketed itself as an anti-inflammatory agent (Tandearil, Oxalid).51,52 Of the two enantiomeric forms of the oral anticoagulant warfarin (Coumadin), only the more active S( —) enantiomer has been shown to undergo substantial aromatic hydroxylation to 7-hydroxywarfarin in humans.56 In contrast, the (R)( + ) enantiomer is metabolized by keto reduction56 (see "Stereochemical Aspects of Drug Metabolism"). 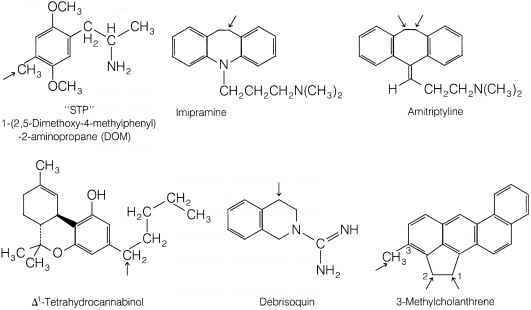 Figure 3.4 • Examples of drugs and xenobiotics that undergo aromatic hydroxylation in humans. Arrow indicates site of aromatic hydroxylation. Arene oxide intermediates are formed when a double bond in aromatic moieties is epoxidized. Arene oxides are of significant toxicologic concern because these intermediates are electrophilic and chemically reactive (because of the strained three-membered epoxide ring). 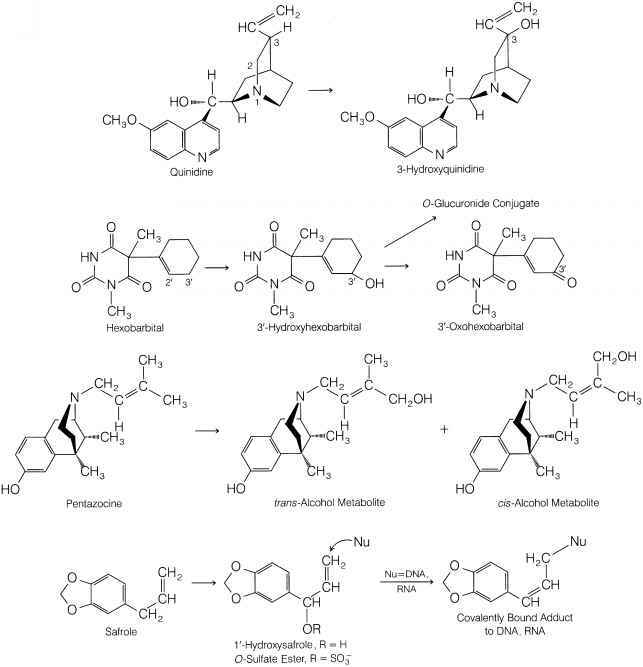 Arene oxides are mainly detoxified by spontaneous rearrangement to arenols, but enzymatic hydration to trans-dihydrodiols and enzymatic conjugation with GSH also play very important roles (Fig. 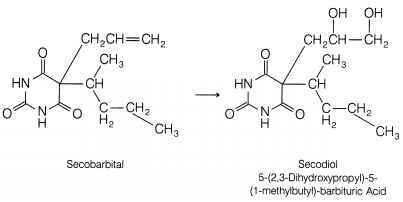 3.5).43,44 If not effectively detoxified by the first three pathways in Figure 3.5, arene oxides will bind cova-lently with nucleophilic groups present on proteins, deoxyribonucleic acid (DNA), and ribonucleic acid (RNA), thereby leading to serious cellular damage.5,43 This, in part, helps explain why benzene can be so toxic to mammalian systems. After its metabolic formation, the arene oxide ring opens in the direction that generates the most resonance-stabilized carbocation (positive charge on C-3 carbon is resonance stabilized by the OCH3 group). The zwitterionic species (positive charge on the C-3 carbon atom and negative charge on the oxygen atom) then undergoes a 1,2-deuteride shift (NIH shift) to form the dienone. Final transformation of the dienone to 3-deuterio-4-hydroxyanisole occurs with the preferential loss of a proton because of the weaker bond energy of the C-H bond (compared with the C-D bond). Thus, the deuterium is retained in the molecule by undergoing this intramolecular NIH shift. The experimental observation of an NIH shift for aromatic hydroxylation of a drug or xeno-biotic is taken as indirect evidence for the involvement of an arene oxide. 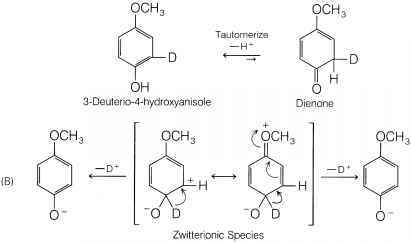 In addition to the NIH shift, the zwitterionic species may undergo direct loss of D+ to generate 4-hydroxyanisole, in which there is no retention of deuterium (Fig. 3.6). The alternative pathway (direct loss of D+) may be more favorable than the NIH shift in some aromatic oxidation reactions. Therefore, depending on the substituent group on the arene, some aromatic hydroxylation reactions do not display any NIH shift. Figure 3.6 • A. General features of the NIH shift or 1,2-hydride (deuteride) shift in the mixed-function oxidation of 4-deuterio-4-hydroxyanisole. B. Direct loss of D+ from zwitterionic species, leading to no retention of deuterium in 4-hydroxyanisole. 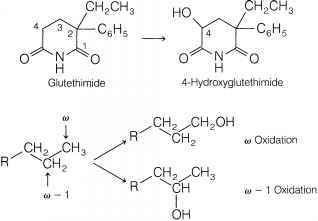 A second enzymatic reaction involves nucleophilic ring opening of the arene oxide by the sulfhydryl (SH) group present in GSH to yield the corresponding trans-1,2-dihydro-1-S-glutathionyl-2-hydroxy adduct, or GSH adduct (Fig. 3.5).44 The reaction is catalyzed by various GSH S-transferases.75 Because GSH is found in practically all mammalian tissues, it plays an important role in the detoxification not only of arene oxides but also of other various chemically reactive and potentially toxic intermediates. 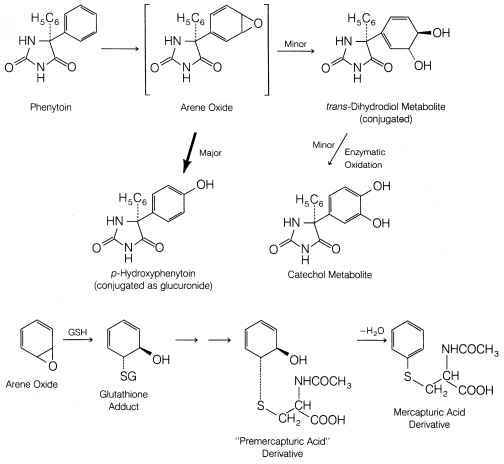 Initially, GSH adducts formed from arene oxides are modified in a series of reactions to yield "premercap-turic acid" or mercapturic acid metabolites.76 Because it is classified as a phase II pathway, GSH conjugation is covered in greater detail later in this chapter. 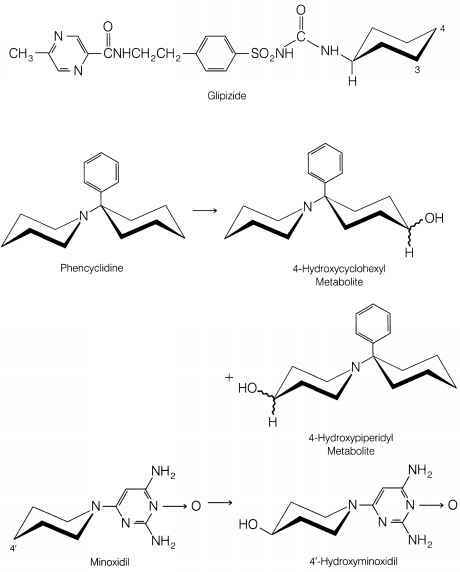 Because of their electrophilic and reactive nature, arene oxides also may undergo spontaneous reactions with nucleophilic functionalities present on biomacromol-ecules.44,45 Such reactions lead to modified protein, DNA, and RNA structures and often cause dramatic alterations in how these macromolecules function. Much of the cytotoxicity and irreversible lesions caused by arene oxides are presumed to result from their covalent binding to cellular components. Several well-established examples of reactive arene oxides that cause serious toxicity are presented below. tissue was confirmed by use of radiolabeled bromoben-zene. The severity of necrosis correlated well with the amount of covalent binding to hepatic tissue. Use of diethyl maleate or large doses of bromobenzene in rats showed that the depletion of hepatic GSH led to more severe liver necrosis. Another carcinogenic polycyclic aromatic hydrocarbon, 7,12-dimethylbenz[a]anthracene, also forms covalent adducts with nucleic acids (RNA).85 The ultimate carcinogenic reactive species apparently is the 5,6-oxide that results from epoxidation of the 5,6-double bond in this aromatic hydrocarbon. The arene oxide intermediate binds covalently to guanosine residues of RNA to yield the two adducts. 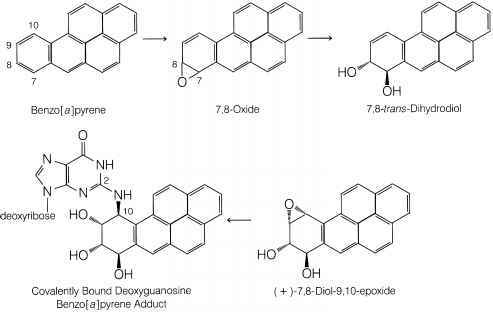 Figure 3.7 • Metabolic sequence leading to the formation of the ultimate carcinogenic species of benzo[a]pyrene: (+)-7R, 8S-dihydroxy-9R, 10-oxy-7,8,9,10-tetrahy-drobenzo[a]pyrene or (+)-7,8-diol-9,10-epoxide. Indirect evidence for the formation of epoxides comes also from the isolation of GSH or mercapturic acid metabolites. 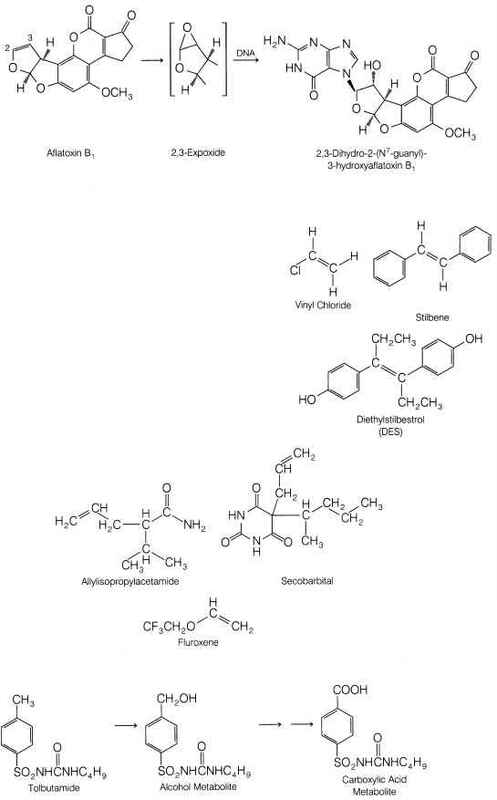 After administration of styrene to rats, two urinary metabolites were identified as the isomeric mercapturic acid derivatives resulting from nucleophilic attack of GSH on the intermediate epoxide.93 In addition, styrene oxide cova-lently binds to rat liver microsomal proteins and nucleic acids.94 These results indicate that styrene oxide is relatively reactive toward nucleophiles (e.g., GSH and nucleophilic groups on protein and nucleic acids). 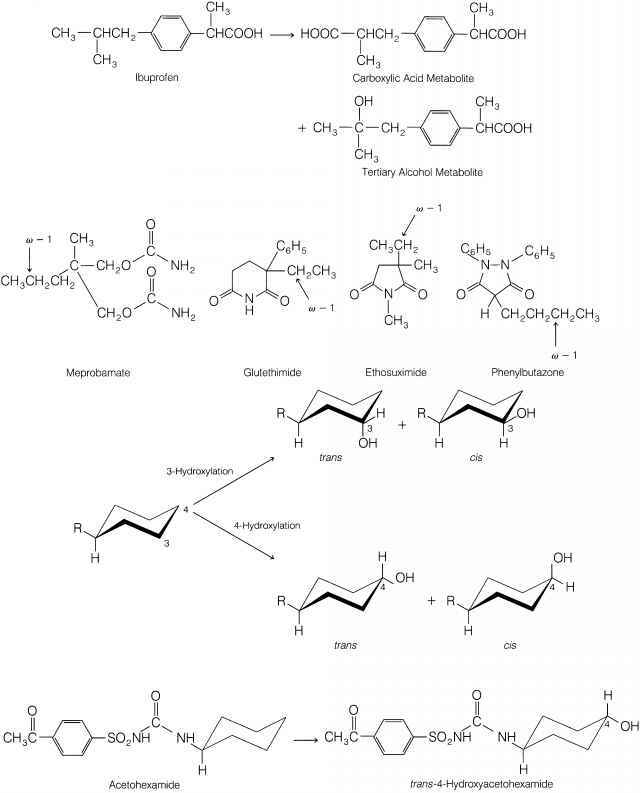 Possible covalent binding to proteins and/or nucleic acids species responsible for the cellular toxicity seen with these compounds. 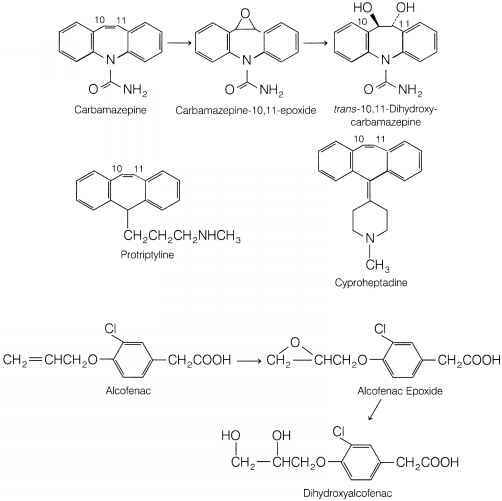 An interesting group of olefin-containing compounds causes the destruction of CYP.104,105 Compounds belonging to this group include allylisopropylacetamide,106,107 secobarbital,108,109 and the volatile anesthetic agent fluroxene.110 It is believed that the olefinic moiety present in these compounds is activated metabolically by CYP to form a very reactive intermediate that covalently binds to the heme portion of CYP.111-113 The abnormal heme derivatives, or "green pigments," that result from this covalent interaction have been characterized as ^-alkylated protoporphyrins in which the N-alkyl moiety is derived directly from the olefin administered.104,105,111-113 Long-term administration of the above-mentioned three agents is expected to lead to inhibition of oxidative drug metabolism, potential drug interactions, and prolonged pharmacological effects. Carbon atoms attached to aromatic rings (benzylic position) are susceptible to oxidation, thereby forming the corresponding alcohol (or carbinol) metabolite.114,115 Primary alcohol metabolites are often oxidized further to aldehydes and car-boxylic acids (CH2OH ^ CHO ^ COOH), and secondary alcohols are converted to ketones by soluble alcohol and aldehyde dehydrogenases.116 Alternatively, the alcohol may be conjugated directly with glucuronic acid.117 The benzylic carbon atom present in the oral hypoglycemic agent tolbutamide (Orinase) is oxidized extensively to the corresponding alcohol and carboxylic acid. Both metabolites have been isolated from human urine.118 Similarly, the "benzylic" methyl group in the anti-inflammatory agent tolmetin (Tolectin) undergoes oxidation to yield the dicarboxylic acid product as the major metabolite in humans.119,120 The selective cyclooxygenase 2 (COX-2) anti-inflammatory agent celecoxib undergoes ben-zylic oxidation at its C-5 methyl group to give hydroxycele-coxib as a major metabolite.121 Significant benzylic hydroxy lation occurs in the metabolism of the ß-adrenergic blocker metoprolol (Lopressor) to yield a-hydroxymetoprolol.122123 Additional examples of drugs and xenobiotics undergoing benzylic oxidation are shown in Figure 3.8. Microsomal hydroxylation at allylic carbon atoms is commonly observed in drug metabolism. An illustrative example of allylic oxidation is given by the psychoactive component of marijuana, A ^tetrahydrocannabinol A1-THC. This molecule contains three allylic carbon centers (C-7, C-6, and C-3). 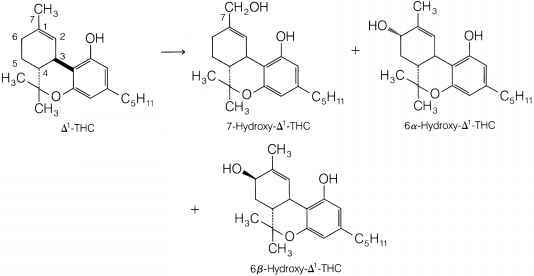 Allylic hydroxylation occurs extensively at C-7 to yield 7-hydroxy- A1-THC as the major plasma metabolite in humans.10,11 Pharmacological studies show that this 7-hydroxy metabolite is as active as, or even more active than, A1-THC per se and may contribute significantly to the overall central nervous system (CNS) psychotomimetic effects of the parent compound.124,125 Hydroxylation also occurs to a minor extent at the allylic C-6 position to give both the epimeric 6a-and 6ß-hydroxy metabolites.1011 Metabolism does not occur at C-3, presumably because of steric hindrance. 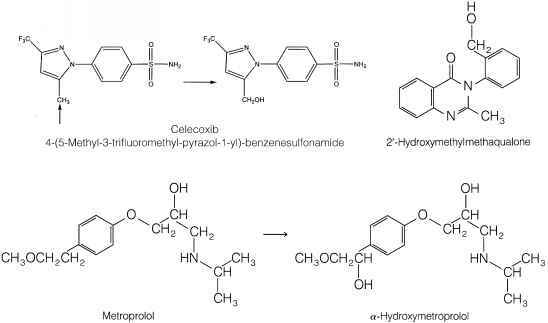 Figure 3.8 • Examples of drugs and xenobiotics undergoing benzylic hydroxylation. Arrow indicates site of hydroxylation. terminal methyl groups of its N-butenyl side chain to yield either the cis or trans alcohol metabolites shown in the diagrams. In humans, more of the trans alcohol is formed.132133 For the hepatocarcinogenic agent safrole, allylic hydrox-ylation is involved in a bioactivation pathway leading to the formation of chemically reactive metabolites.134 This process involves initial hydroxylation at the C-T carbon of safrole, which is both allylic and benzylic. The hydroxyl-ated metabolite then undergoes further conjugation to form a sulfate ester. This chemically reactive ester intermediate presumably undergoes nucleophilic displacement reactions with DNA or RNA in vitro to form covalently bound adducts.135 As shown in the scheme, nucleophilic attack by DNA, RNA, or other nucleophiles is facilitated by a good leaving group (e.g., SO42") at the C-1 position. The leaving group tendency of the alcohol OH group itself is not enough to facilitate displacement reactions. Importantly, allylic hydroxylation generally does not lead to the generation of reactive intermediates. Its involvement in the biotoxification of safrole appears to be an exception. The mixed-function oxidase system also oxidizes carbon atoms adjacent (i.e., a) to carbonyl and imino (C =N) functionalities. 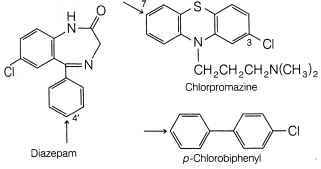 An important class of drugs undergoing this type of oxidation is the benzodiazepines. For example, diazepam (Valium), flurazepam (Dalmane), and nimetazepam are oxidized to their corresponding 3-hydroxy metabolites.136-138 The C-3 carbon atom undergoing hydroxylation is a to both a lactam carbonyl and an imino functionality. 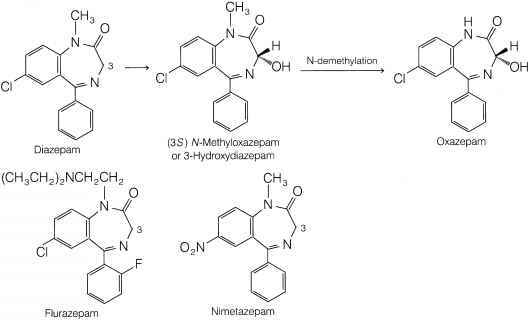 For diazepam, the hydroxylation reaction proceeds with remarkable stereoselectivity to form primarily (90%) 3-hydroxydiazepam (also called N-methyloxazepam), with the (S) absolute configuration at C-3.139 Further N-demethy-lation of the latter metabolite gives rise to the pharmacologically active 3(S)(+)-oxazepam. Alkyl or aliphatic carbon centers are subject to mixed-function oxidation. Metabolic oxidation at the terminal methyl group often is referred to as w-oxidation, and oxidation of the penultimate carbon atom (i.e., next-to-the-last carbon) is called w-1 oxidation.114,115 The initial alcohol metabolites formed from these enzymatic w and w-1 oxidations are susceptible to further oxidation to yield aldehyde, ketones, or carboxylic acids. 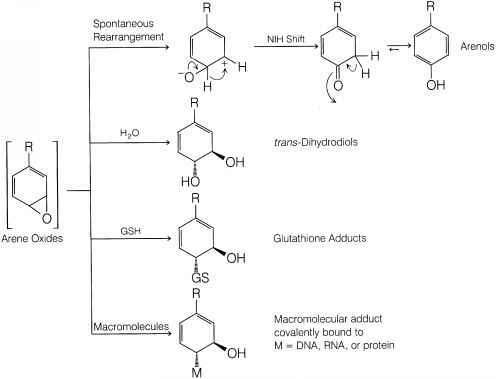 Alternatively, the alcohol metabolites may undergo glucuronide conjugation. Aliphatic m and m-1 hydroxylations commonly take place in drug molecules with straight or branched alkyl chains. 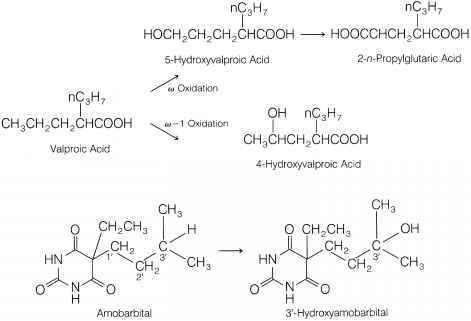 Thus, the antiepileptic agent valproic acid (Depakene) undergoes both m and m-1 oxidation to the 5-hydroxy and 4-hydroxy metabolites, respectively.142,143 Further oxidation of the 5-hydroxy metabolite yields 2-n-propylglutaric acid. The cyclohexyl group is commonly found in many medicinal agents, and is also susceptible to mixed-function oxidation (alicyclic hydroxylation).114,115 Enzymatic introduction of a hydroxyl group into a monosubstituted cyclo-hexane ring generally occurs at C-3 or C-4 and can lead to cis and trans conformational stereoisomers, as shown in the diagrammed scheme. Oxidative N-, O-, and S-dealkylation as well as oxidative deamination reactions fall under this mechanistic pathway. 2. Hydroxylation or oxidation of the heteroatom (N, S only, e.g., N-hydroxylation, N-oxide formation, sulfoxide, and sulfone formation). 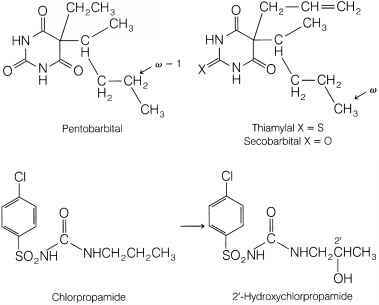 hydroxylated products may undergo secondary reactions to form other, more complex metabolic products (e.g., oxime, nitrone, nitroso, imino). Other oxidative processes that do not fall under these two basic categories are discussed individually in the appropriate carbon-heteroatom section. The metabolism of carbon-nitrogen systems will be discussed first, followed by the metabolism of carbon-oxygen and carbon-sulfur systems. What the important component of the drug oxidation system? How cyt. p450 play role in oxidative reaction?